“One of the best restaurants in Chicago”(Chicago Magazine), will be pouring exclusively Wyncroft and Marland wines all evening. Limited Communal Style Seating, so make a reservation now ! In the new, old foundry building - 600 E Michigan Ave, Kalamazoo, MI 49007. Chef Chris Franz of Atwater in the Park serves up a multi-course gourmet dinner that pairs perfectly with Wyncroft and Marland wines presented by Owner/Winemaker, James Lester. 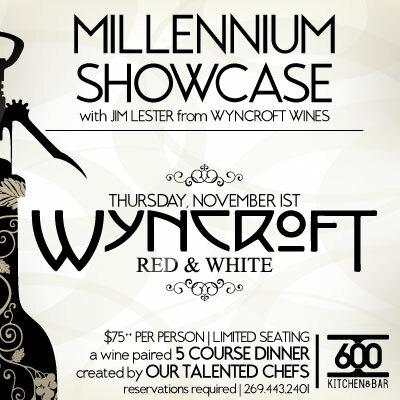 The $60 cost includes the meal, paired wine and a $5 credit toward take-home purchase of Wyncroft or Marland wine that night. At the exclusive tasting event, guests can interact with the craftsmen and women who are behind the scenes at the best Michigan wineries. Plus, seasonal food options for purchase to complement the tastings and live music provided by Kaleidoscope Eyes and Erik Donner. ONE DAY ONLY - Michigan's wine & hard cider producers are taking over Eastern Market! Meet the makers and sample a variety of wines and ciders from more than 40 businesses.